What our clients have to say about our service. Thanks especially to the site supervisor, under his supervision the crew completed the job on schedule and we were very pleased about that. Thank you I will happily recommend Incredible to friends. Excellent service from start to finish! All of your people are FANTASTIC, this is just a wonderful company, each member takes pride in their part and their work. Thank you! I would like to comment not only on the amazing job that incredible did cleaning our carpet but also on the professionalism and integrity of the staff. I was very pleased as to how courteous and pleasant the staff was, they tackled the job with care and skillfulness. I would not hesitate to recommend the company in the future. Incredible was very professional, friendly and accommodating to our staff and clients! We were very pleased with the overall service we received from all your hard working, dedicated staff. The site supervisor was excellent in communicating work schedules with me (given my busy work obligations), and overseeing our “Flood Rescue” from start to finish. OUTSTANDING customer service and attention to detail. Incredible went above and beyond our expectations, Thank you!! It was a pleasure dealing with Incredible Restorations and the professionalism provided overall! I just wanted to take a moment and let you know that I inspected my suite yesterday after you and your team completed the restorations. I have to say that I am extremely impressed with the work. You matched the paint color perfectly, the carpets and baseboards look great and you cant tell that there was ever a flood in the suite! The tenant tells me that your team put back all the furniture as it was before and they were very happy to work with you as well. 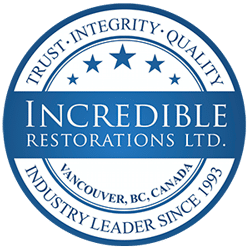 You have always been responsive and professional and I am happy to recommend you and your team to anyone for restoration services. Thanks so much for a job well done! Awesome work-great cleanup! Very professional, Thanks!